The ancient technique Nizanka was very common in Belarusan lands for making sacral embroidered items such as ‘roushniks’ which played an important role in old rituals and customs. There are two Nizanka stitching rules that meet sacral requirements. The work has no knots, as a knot is considered an obstruction for Good energy. Nizanka stitching is reversible, showing meaningful symbols on both sides of stitched item. Because of these characteristics and that it’s easy and quick to work up, I love to work with Nizanka. 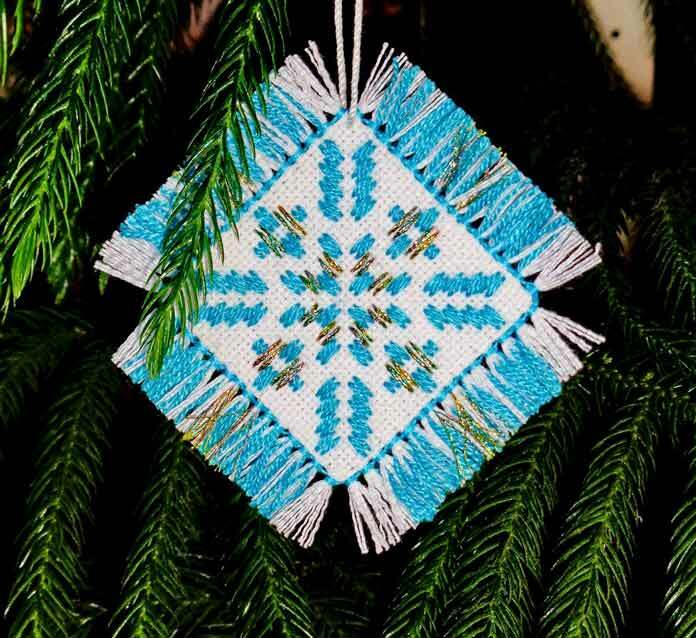 Thinking about those three features of Nizanka in anticipation of winter festive season I came across the idea to use it for Christmas ornaments. It was fun for me to design the Belarusan Nizanka Ornaments. I hope it will be as such for you to stitch them. I believe there can be numerous patterns for this design; so after you stitch one and get the stitching method, I encourage you to try to make your own.